WETI - What are you waiting for? The WETI Institute is a private, nonprofit organization dedicated to scientific research, education and public outreach. The members of the organisation operate from six base stations, located in strategically important countries distributed all over the globe. All base stations are selected to provide a peaceful environment that is pleasing for the human eye and thus ideal for our endeavour. The infrastructure of the WETI institute, or, more precisely, the lack thereof, is hosted in Berlin/Germany. As of today, the WETI Institute is exclusively driven by curiosity, perseverance, and the odd few minutes of accidental waiting for public transport. In order to be able to sustain our efforts, the Institute welcomes support from private foundations or other groups/individuals interested in WETI. The WETI Institute is part of OPEU, the Organisation for the Passive Exploration of the Universe. The mission of the WETI Institute is to understand and explain the origin, nature and prevalence of intelligent life in the universe. The WETI Institute has chosen an entirely novel approach to achieve that goal. Instead of actively searching for extraterrestrial intelligence, the idea is to simply WAIT - until the others find us. Waiting is a notoriously underappreciated method in our efforts to search for extraterrestrial intelligence. It is cheaper and less stressful than any other type of research. It is also environmentally friendly and does not cause global warming, terrorism or nuclear conflicts. The WETI Institute has assembled an assorted group of professionals to explore the benefits of waiting for our understanding of life in the Universe. Combining the expertise from a wide range of disciplines - astrophysics, biology, neurology, psychology, philosophy - our objective is to set a new gold standard for scientifically meaningful waiting. We assume we are conducting the most profound waiting in human history - waiting to know our beginnings and our place among the stars. Numerical simulations have shown that events that will occur with a certain finite probability at any given time will eventually occur with certainty, if only we wait long enough. This is strong evidence for the universal validity of our waiting approach, and it has profound implications for all fields of human endeavor. We do not need to invoke science, however. When you've lost a companion in a large crowd, the best strategy is not to run around looking for the other person, but to remain in place and wait for them to find you. It would be outlandishly foolish to give up one's own known position to reach the unknown position of another person, who might have wandered off from that position already anyway. And since, in a philosophical sense, both humans and extraterrestrials are lost in a huge and very empty crowd called outer space, the very same logic applies there. Mankind has always felt the urge of actively doing something of extraordinary relevance. By doing so, we have caused a great deal of grief and disaster. The WETI Institute proposes to abandon our reckless anthropocentric ambition, and to strive for a more humble approach of letting the universe explore us instead. 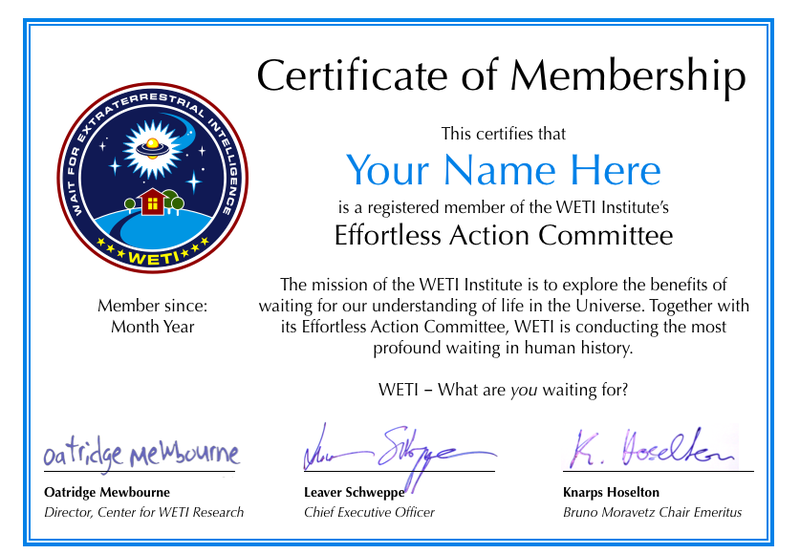 Interested scientists as well as laypersons are invited to join WETI's Effortless Action Committee. You will instantly receive an attractive Certificate of Membership suitable for framing (preview it here).